A striking, blue/gray leaf, slow growing palm. Ripe fruit are about the size of large cherry, yellow/orange, and edible. They have a sweet initial taste with a tart aftertaste (leave to ripen fully for the sweetest taste). The taste is a mixture of pineapple, apricot, and vanilla, also described as apple, pineapple, and banana together. Simply peel the flesh away and eat it, prepare a soft puree, or use the fruit in jelly. Although delicious when eaten fresh they are often preserved. Jelly palm fruits are picked as they ripen. If whole bunches are harvested, they tend to ripen all at once. They keep well under refrigeration for around a week. The fruit are also called palm dates and were used to make jelly because they contain a good amount of pectin. That same pectin makes for a cloudy wine, the other common use and name for the plant, Wine Palm. 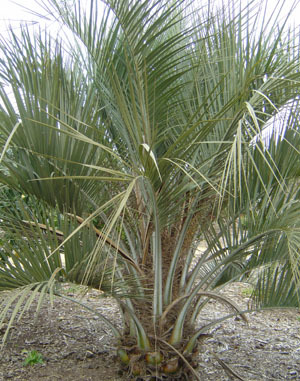 Also called Pindo Palm. The seeds are about 45% oil and are used in some countries to make margarine. Very hardy. Full sun, semi shade Prefers winter dry and summer water. Frost tolerant to -10C.